In a city which seems to have an alternative to just about everything that is mainstream, the Alternate Parade of Homes has become a Madison institution. 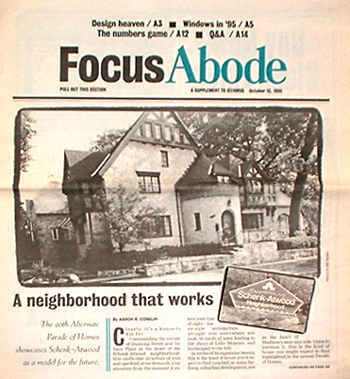 In the mid-1970's a group called Historic Madison began arranging an annual tour of old homes to build interest in historic preservation and extol the viability of rehabilitation instead of demolition. The event was immediately successful. People like old things and they like to go through other people's houses. In 1995 Design Coalition offered to take over coordinating the event in order to add a fresh spin: to showcase a whole neighborhood and celebrate viable historic versions of what city planners are now calling the New Urbanism. We produced walking tour brochures that included photos and histories of 8 fine old homes. A companion brochure presented the century-old Schenk-Atwood neighborhood to illustrate the elements of traditional neighborhood design. We featured a sister neighborhood, Williamson-Marquette, in the 1996 Alternate Parade. To view the Alternate Parade of Homes Brochures, click here. Also see the article, "A Walk through Traditional Neighborhood Design".